Nut/Cracked – The Bang Group’s beloved, witty response to The Nutcracker has delighted audiences for more than 16 years. Nut/Cracked takes its inspiration from all corners of the dance canon, from tap riffs to en pointe ballet, by way of bubble wrap, disco and Chinese take-out noodles. In Nut/Cracked, choreographer David Parker finds beauty in the ridiculous, waltzing us through many incarnations of Tchaikovsky’s score, including versions by Duke Ellington and Glenn Miller, as well as the traditional orchestral suite. You’ll never watch The Nutcracker in quite the same way again! The Bang Group was founded in 1995 by Jeffrey Kazin and David Parker. It is dedicated to Parker’s love of rhythmic form and is known for its commitment to craftsmanship, creative liberty and aesthetic diversity. 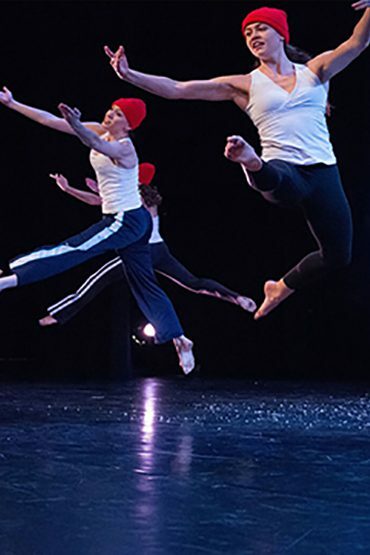 The company has toured and performed in 24 of the United States and appears internationally at festivals and venues in Austria, Belgium, Croatia, Czech Republic, France, Germany, Italy, Monaco, The Netherlands, Scotland, Slovakia, Switzerland and Canada. It has enjoyed four seasons presented by New York Live Arts and six by its predecessor, Dance Theater Workshop, three by Danspace Project as well as several by DanceNow/NYC, Symphony Space, Harkness Dance Festival, Lincoln Center Out of Doors and others.